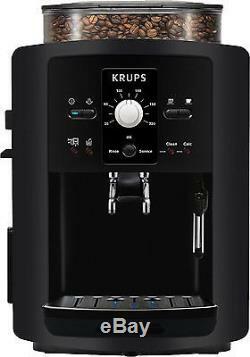 KRUPS EA8000 coffee espresso cappuccino coffee machine fully automatic black. > Innovative technology in an ultra compact design. >> Patented Compact Thermoblock technology. >> Metal conical burr grinder. Innovative technology in an ultra compact design. 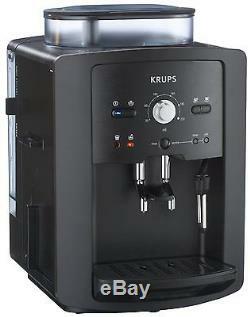 Equipped with the exclusive Perfect Coffee System provides the KRUPS EA8000 coffee enjoyment at the highest level. Stylish design, unique ease of use and superior product quality characterize this series. Patented stainless steel thermoblock up for hot coffee from the first cup. Thanks to the CTS technology is at the EA8000 not necessary to descale the coffee cycle. This guarantees a long life of the machine. Individual settings of coffee strength, water volume and temperature. For perfect coffee quality is the right grind is decisive. The metal quality conical burr grinder is individually adjustable to the roast of your coffee and guarantees a constant, fine grind for optimal coffee enjoyment. The automatic cleaning program and the brewing unit with integrated protection compartment complete the convenient operation of the EA8000. Bean container: 275 g beans. Knob to select the amount of coffee, 20 to 220 ml. Variable brewing unit, capacity of 6 to 9 g. Adjustable conical burr grinder (3 positions). Automatic cleaning and descaling program. Removable Control Association (protects the brewing unit from dirt). Dimensions: 245 x 365 x 330 mm. Some items might come with a default language in German you will have to go in the menu and select the language you need or change on start-up. Electric items come with 2 round pin Europe style plugs, we will include an adapter depending on the destination country. Counties with strict custom rules and regulations like: Russia, Vietnam, Ukraine, Kazakhstan, Brazil, Chile, Uruguay, Israel, etc, may take longer due to strict custom rules and regulations, not couriers delay. We cannot control on know about this delay in advance. Clients must check their packages before accepting and signing for them. We cannot calculate this cost for you in advance. Most countries just add VAT on the declared value of the package. The rules are different in every country. Unfortunately we cannot know the rules, regulations or practices for each country. Please check the package before receiving the item. Items that are sent back should be sent with original packing and all accessories included in the package received. We try to maintain high standards of excellence. Eedback is very important to us. We cannot resolve any issue, if we do not know about it! We are always here and want to keep our customers satisfied, we will solve any issue that might occur. Please have a look at our. The item "KRUPS EA8000 coffee espresso cappuccino coffee machine fully automatic black" is in sale since Sunday, July 5, 2015. This item is in the category "Home & Garden\Kitchen, Dining & Bar\Small Kitchen Appliances\Coffee, Tea & Espresso Makers\Espresso & Cappuccino Machines".